Although I learn to knit years ago it was only recently that I picked it up again. Not that I was ever very good. I only managed to learn to knit, purl, cast on and off but thanks to Julie’s help I have managed pick up some new skills, like cabling! It wasn’t nearly a hard as I thought it would be! 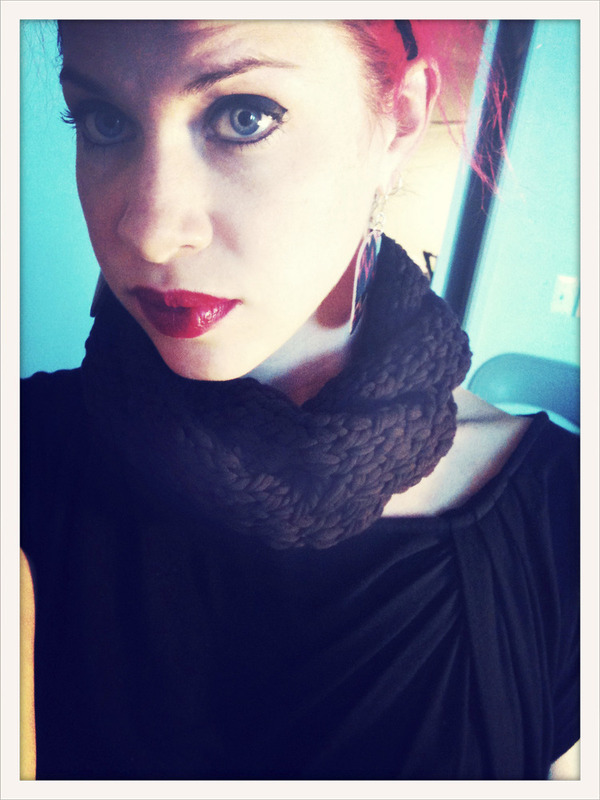 Project #1 was the Burberry Inspired Cowl Neck Scarf by Julianne Smith. Mine turned out a bit different since adjustments had to be made to accommodate the bulky yarn I wanted to use (left overs from a hat I made for a baby shower but had to use a different yarn). This pattern was supper easy, even for me, and it knitted up fast. Now that I could cable I started to play around with it. Project #2: Inspired by Hurley Sashimi and the Hollis Rope Chain I came up with my own simple rope using the left overs the cowl. Repeat pattern to desired length, seam ends together. It’s the perfect length for the wee one. 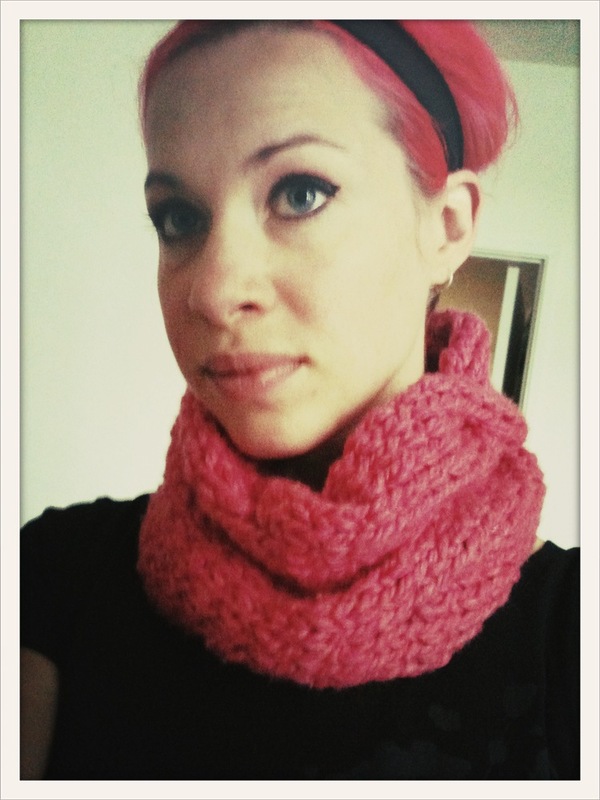 Project #3: I ended up making another cowl with my knit yarn. This one is much like project #2 but wider and more cables. The trickiest thing was dealing with the “yarn”. It stretches over the needles so I ended up having to use a much larger gauge needed then the end product looked like I did. 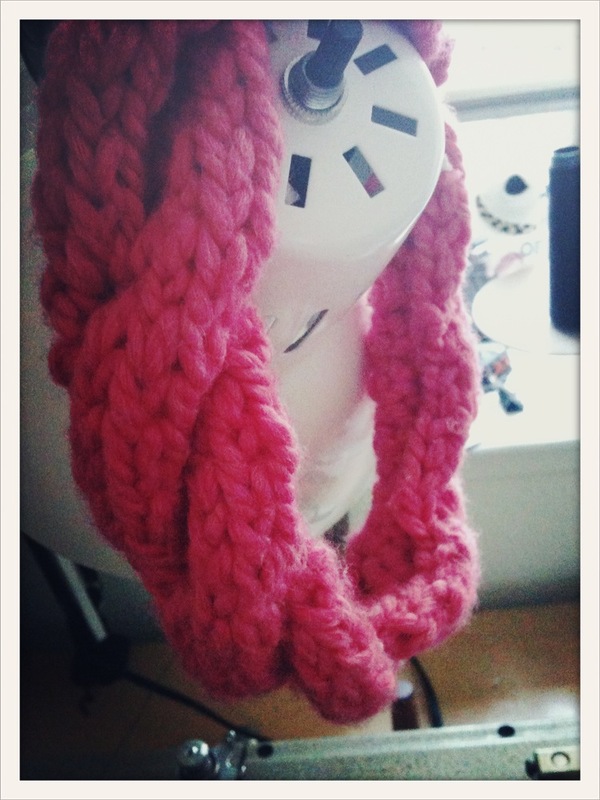 All in all I am very happy to be knitting again and even happier to have the skills to make more then just scarves. Now on to pictures and pdfs! I was planing on posting this yesterday but got distracted sampling changes to the shorts for the kids pyjama pattern I’m working on (more on that later). As someone who is used to cardboard coffee cup sleeves I enjoy this more colourful and customizable version better, even if it means trying to remember it when I go out for coffee. The tutorial is for three different styles of coffee cup sleeves in three difficulty levels: bound edge, easiest; wrap around, medium and plain, hardest. The instructions are presented in order of difficulty. I’d love to see what others come up with! It all started with Mina’s favourite fabrics. Mina has a two favourite fabrics; Japanese three little pig fabric (her hoodie) and red and white Ikea hippo fabric (sweet pea dress). She absolutely loves her hoodie, she plays with it and asks to wear it even indoors. I had a few scraps of fabric left and thought I needed to make something for her with it. 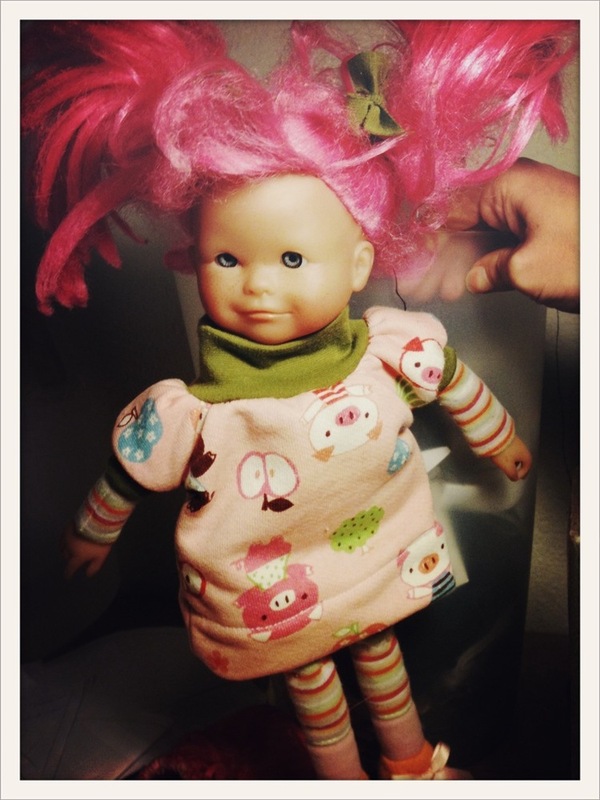 So I decided to make her favourite doll Gee a new dress. The pattern was supper easy to make so I decided to turn it into a tutorial. The tutorial is for the basic dress with directions for making Gee’s version. Download the pdf for instructions on drafting the pattern and sewing the dress. Lola models the basic version in the Ikea fabric that Mina likes to pull from the closet and carry around the apartment.